Do we definitely know the growth pattern of dinosaurs? No, we really don’t know for certain what kind of growth pattern the dinosaurs had, and there are several reasons why. First, not all dinosaurs shared the same growth rate. Different types of dinosaurs probably grew at varying rates, complicating the subject. The second reason for the uncertainty in growth rates has to do with climate. Dinosaurs inhabiting warmer regions of the planet probably grew more rapidly than those living in colder climates. Another reason has to do with the metabolic rate of dinosaurs, which is an area of intense speculation. Warm-blooded vertebrates with higher metabolic rates can grow up to ten times faster than cold-blooded vertebrates. 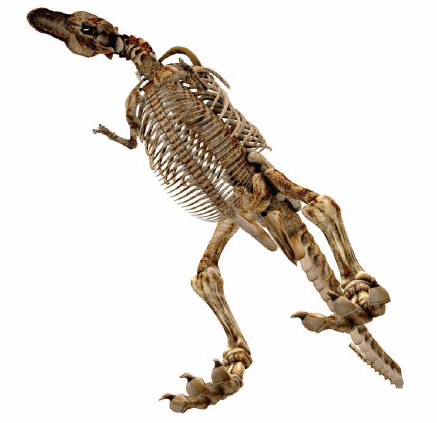 Dinosaurs with potentially higher metabolic rates, such as the small theropods, might have grown faster than the slow moving sauropods, though not larger. It might be possible to estimate the age of a dinosaur (here, a T rex) by analyzing the growth pattern in its bones (Big Stock Photo).